I still need to figure out who all gets arrows. I still owe OWAs quality and your token pack it looks like as well. You have a new Blue Pack! Bonus: The top three highest Boo counts wins a Pack Upgrade each at the end of the week. Token: Take 5 times your level and score that many "Points" worth of AAAs. 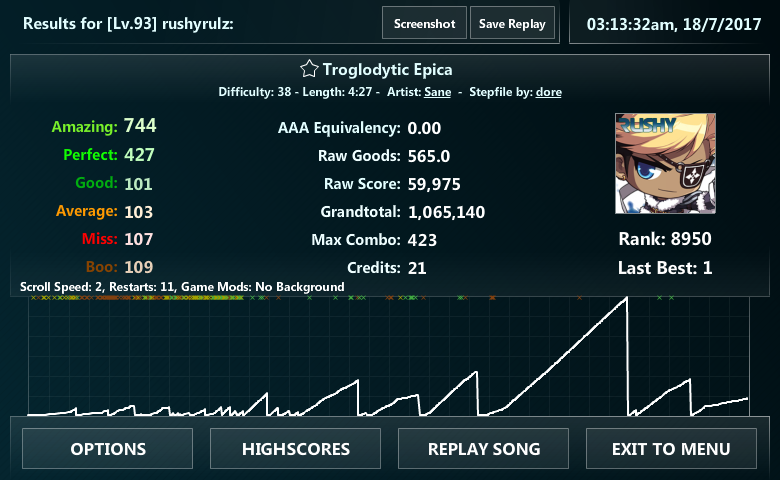 You earn the number of points per AAA equal to the song's difficulty. Example: I am level 72, so I would need 360 "Points" to Qualify. 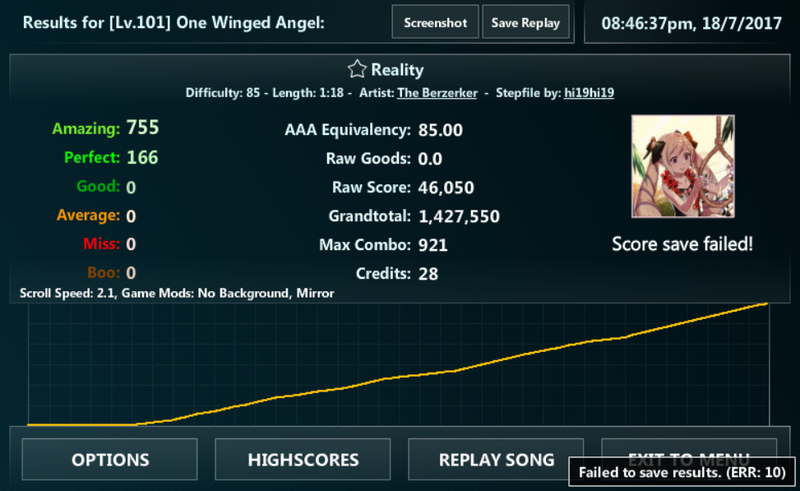 A AAA of a difficulty 55 song would give me 55 Points. I would then need at least 305 more points to qualify. Songs may not be repeated. This challenge ends 7/23/2017 at 11:59 P.M.
Last edited by FFR TCG; 07-18-2017 at 12:39 AM..
what is the probability of pulling a T12 card in a T12 or bust pack? Last edited by avadram; 07-18-2017 at 09:01 AM..
Last edited by awein999; 07-18-2017 at 09:27 AM..
Obviously, this is nowhere near optimized, but I don't think I can get 1500 boos from a song of this length anyway. 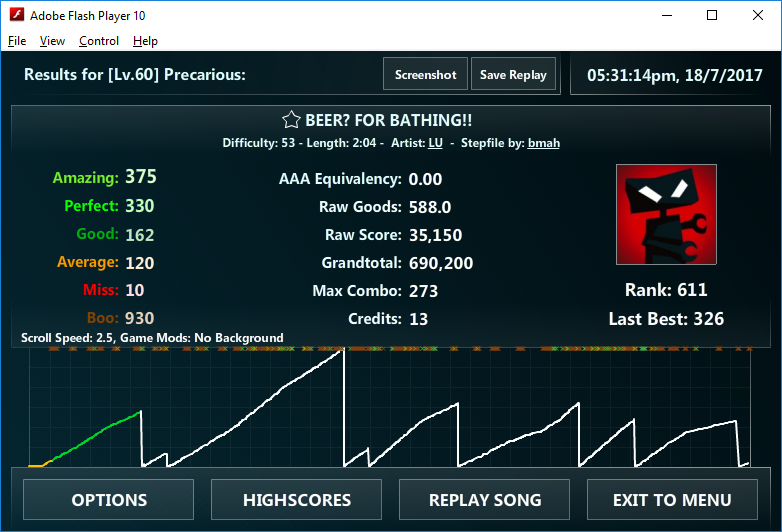 I'll have to see if I can unlock B-E-E-R during the week. I really like this week's token challenge, by the way. Yeah, I just got it. Last edited by TheSaxRunner05; 07-18-2017 at 02:25 PM.. If my math is correct, a .37% chance, or about every 270 T12 or bust packs. Edit:// I hope none of you quality pack people are superstitious, it should theoreticallly give a T12 every 666.666... packs. Last edited by TheSaxRunner05; 07-18-2017 at 02:44 PM..
Last edited by One Winged Angel; 07-18-2017 at 06:00 PM.. Token Fusions give random results now, so you don't have to specify what is being combined with what - we ditched the fusion table. What I can do if you'd like, is trade all that you've listed there into 1 Tier 6 Card. would I not be losing cards if I traded all those in for a single T6?